Starting the bouldery descent into Bridia Valley. 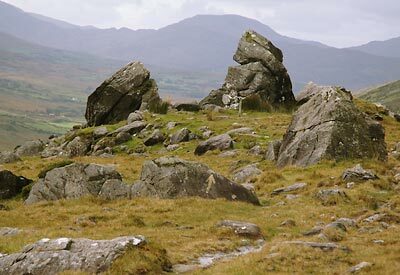 Starting from the church in Black Valley, the Kerry Way begins to weave its way west towards the head of the valley. The road goes for a few hundred metres before a turn to the right rises to meet Kerry's famous Gap of Dunloe. Our trail ignores this turn-off however and continues straight ahead for around 2½km on the tarmac road, holding a steady distance between the towering Macgillycuddy's Reeks above on the right and the Gearhameen River below to the left. Having passed the lower lake of Cummeenduff Lough and reaching the last houses of Cloghernoosh, the Kerry Way starts to follow a green road through some forestry. Brassel Mountain (575m) looms to the north as the green road eventually tapers out after 1km and emerges from the coniferous trees to traverse wet grassy fields for a further kilometer. The imposing stature of Broaghnabinnia (745m) lies straight ahead with the picturesque Lough Reagh nestled below. Upon reaching Dromluska, the Kerry Way once again joins a tarmac road for around 2km as it follows Cummeenduff Glen to its end. Once having passed the last remaining farm dwellings, the trail rises steeply towards the saddle between Broaghnabinnia and Curraghmore. The terrain for this section is very rocky and wet. Great care is needed both in keeping a firm footing but also to keep the signage posts in sight. The height at the saddle is around 300m and it provides spectacular views of both Bridia Valley in front and Black Valley behind. Extreme caution is needed for this section, especially in wet conditions. Similar to the ascent from Black Valley, the descent into Bridia Valley is even more steep and slippery. The Kerry Way follows the bouldery ridge down into the valley for around 1km before arriving at more welcoming footing at some farmland. With a further kilometer on road leading to Maghanlawaun, one will be greatly surprised to come across the Cooky Monster's Café in this remotest of places.